One of main things I took away from The Big Allotment Challenge (BAC) was a new love of flowers. I never really appreciated the beauty of all the different blooms and what you could do with them. I was of the idea, if I can’t eat it, I don’t want to grow it. I remember my interview for BAC in London, I was put in front of a desk covered in all sorts of flowers, vases and floral foam and asked to make a floral arrangement in 5 minutes. The stop watch was started and the camera was thrust in my face. While i was trying desperately to throw something together, I was been asked questions about why I’d chosen certain flowers. In the end, I had a large, straight sided vase with 3 large sunflowers in. I’d wrapped them in raffia so they stood up together, facing out in a triangle. I then stood them in the vase and surrounded the base of the stems with pebbles to support the blooms. To finish the arrangement off, I filled the rim of the vase with lots of lovely drooping tulips, so that it was a multi-layered design. Admittedly, it was no Best In Show, however it was a pretty arrangement for a surprise 5 minute challenge. After making arrangements from a floral basket, to a candelabra and finally a huge floral arch, my appreciation for flowers has grown exponentially. 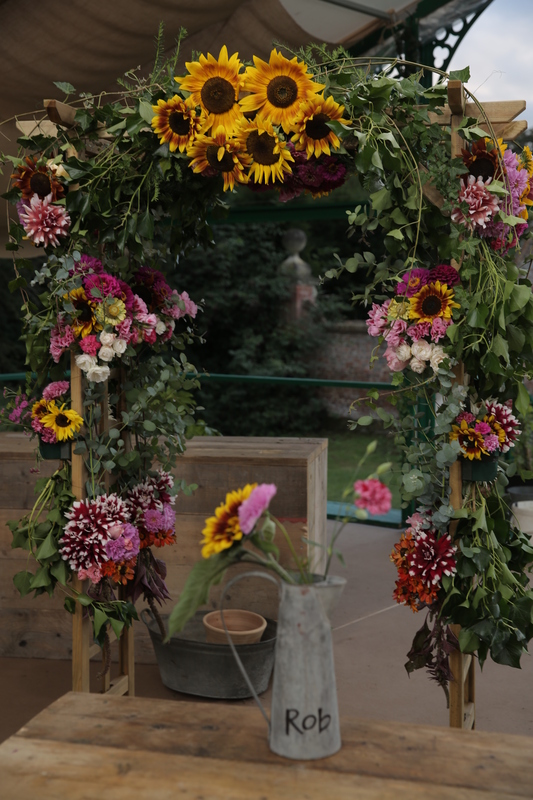 I love the way different flowers can be used, from Helichrysum in dried arrangements, to dahlias and sunflowers in big bold ones. As my love for flowers has grown, so has the number of plants that produce them. 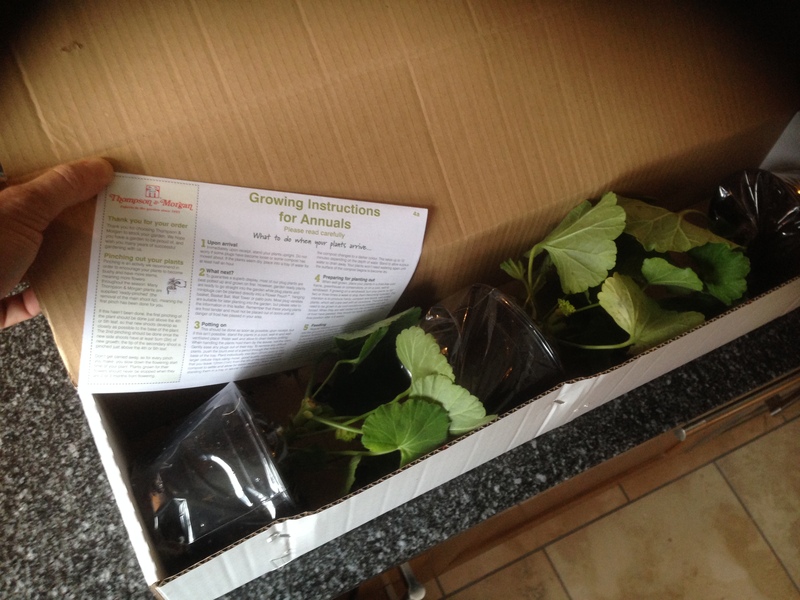 In fact, I’ve bought plants online and in person. Online ordering is something I said I would never do again. I ordered some zinnia plugs for BAC last year from a well known supplier and they were terrible. 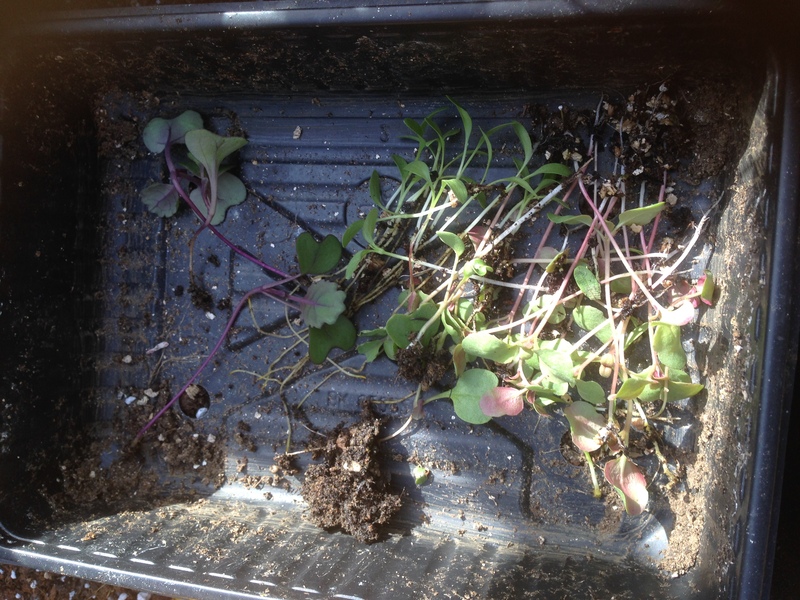 They were leggy and terrible quality, the only place I put them, was on the compost heap. So, ordering more plants on line (not from the same supplier) was a little daunting, I didn’t know if I’d get the same poor quality plants again. Thankfully, all the plants I’ve received so far have been great quality, but plugs and potted plants have been healthy, green and compact. 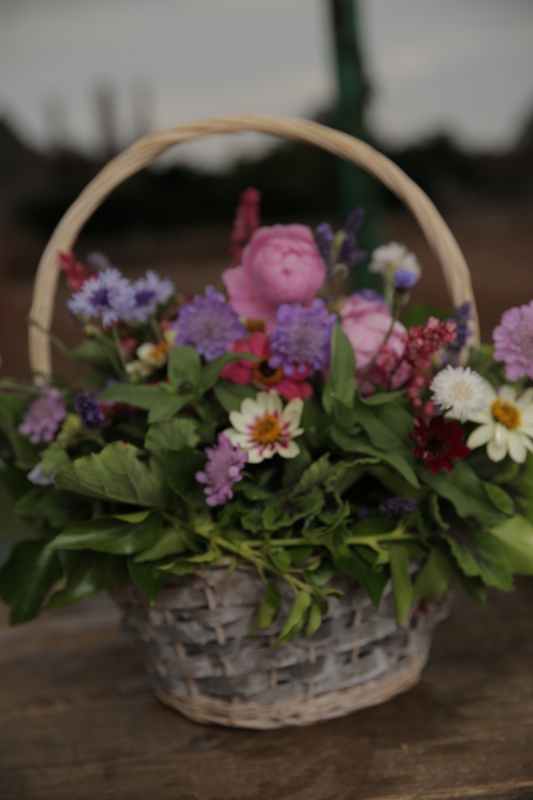 I wanted flowers this year that I could enjoying the garden, on the plot and in the house as cut flowers. Therefore, I’ve gone for geraniums (yes I know they are technically pelargoniums) to have on my patio. I love the ones I see when I visit my friend in Spain, she has them all over her roof terrace and they look amazing, thats why i went for the burgundy wine geranium with its deep red blooms. Ive also gone for the rather different appleblossom rosebud geranium which has a cluster of almost rose like flowers in shades of pink and white. I thought this would make a statement on the patio between the deeper red variety. 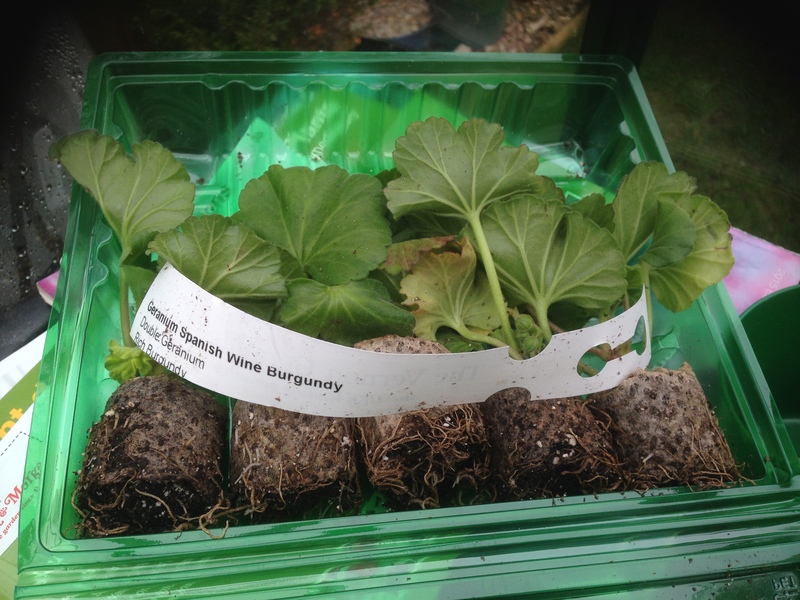 The geraniums arrived packaged well, as you can see, I ordered some plug plants, which are smaller, cheaper and easy to grow on. I also ordered some potted plants, these are just about ready to plant in their final position in the garden and will create a bigger plant, quicker. The ‘crimson rim carnations‘ are a hardy variety, so they should come back year after year as long as you give them a little protection over the winter, and don’t let them freeze solid if you plant them in pots. I never really used to like carnations, I thought of them as ’emergency flowers’ from the petrol station. I guess they are almost a failure because of their own success, they are everywhere. Why bother growing ones you can find in the florists? I find it better to grow unusual ones that you can’t buy, thats the whole point of gardening to me. ‘crimson rim carnations‘ are cream coloured with a dark red/purple rim around the outside of the bloom, a truly beautiful flower. The common garden plant, the ‘floss flowers‘, is a great plant for the flower bed. It produces tonnes of gorgeous fluffy flowers in shades of pink, blue and pale pastel shades. It will grow just about anywhere as long as the soil isn’t boggy. Spacing the plants 8 inches apart will give maximum blooms for the smallest space. 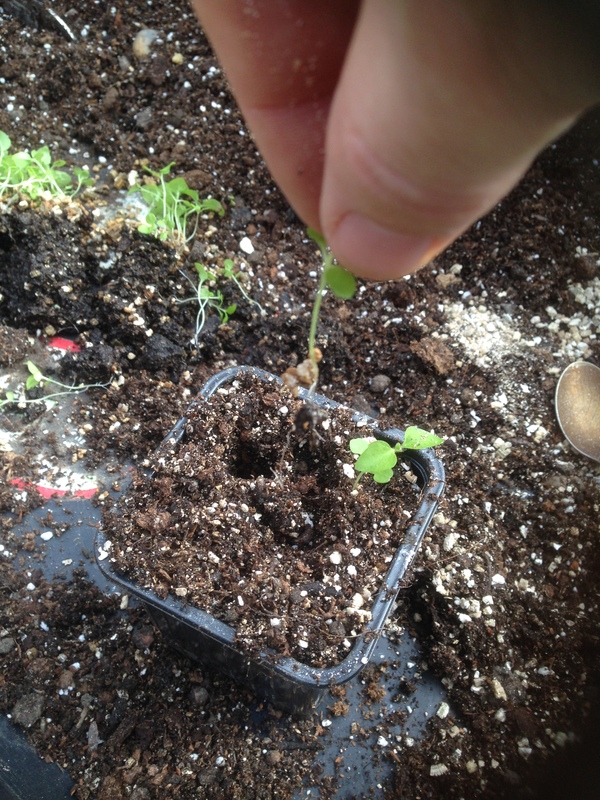 As you can see, i’ve pricked my plants from a tray of seed compost, and I’m now planting them up, 4 to a pot. 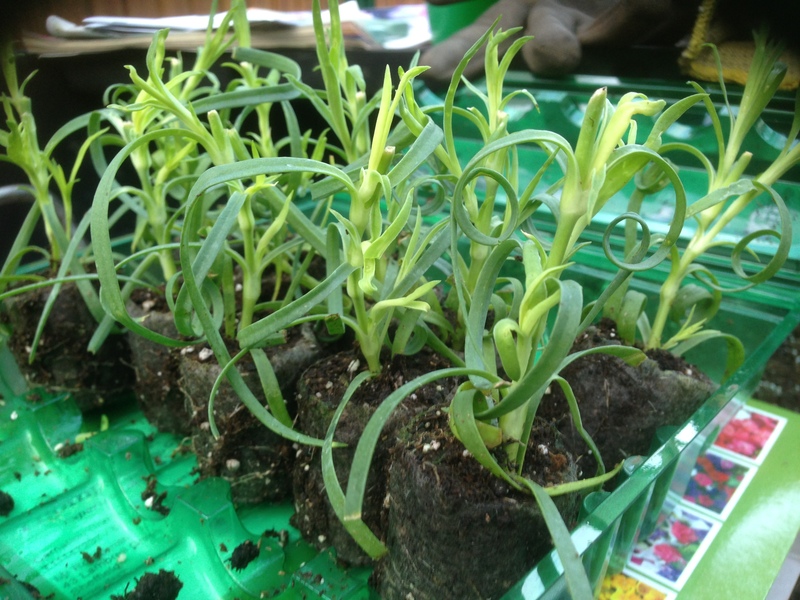 I would normally put one plant in its own pot, but I don’t have the space in the greenhouse at the moment, so 4 in a pot will do for a few weeks until they are 3 inches tall and I can pot them up individually and start to harden them off in the cold frame. Floss flowers make a good cut flower, so again, I’ve got a good mix of shapes and colours going on in the flower bed this year. I couldn’t leave without mentioning my peach tree. 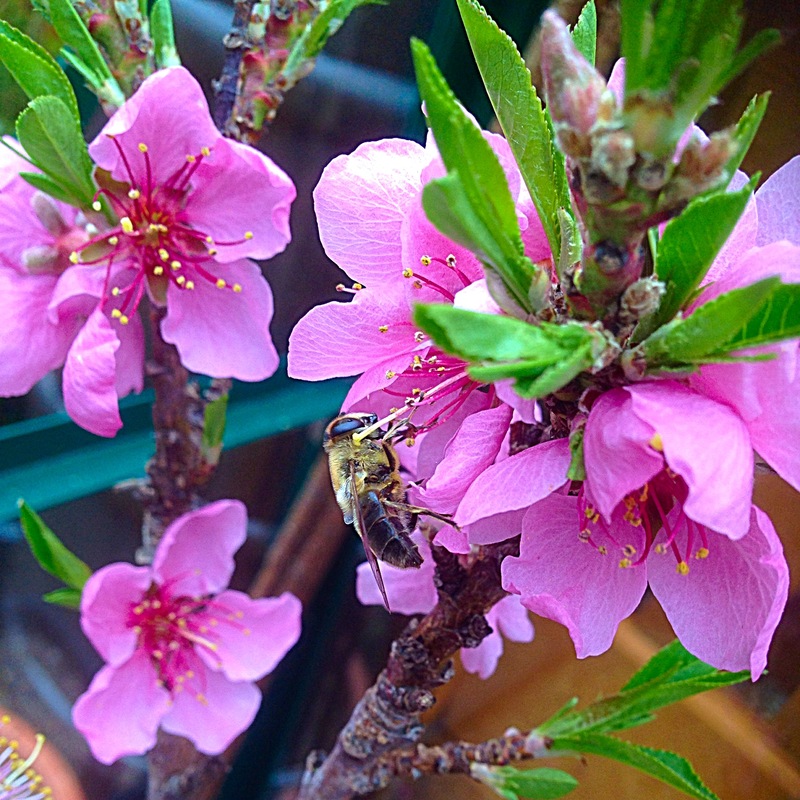 As you can see from the photo, I had a little friend helping me pollinate the peaches in the greenhouse the other day. Its the first bee I’ve seen this season, so I hope he’ll be bringing all his friends back to my plot to help me produce some amazing crops and flowers this year.